It is with heavy hearts that we announce the peaceful passing of our Mother, Grandmother and Great-Grandmother, Violet, with her family by her side on Saturday, April 6, 2019 at East Gate Lodge in Beausejour, MB at the age of 94 years. 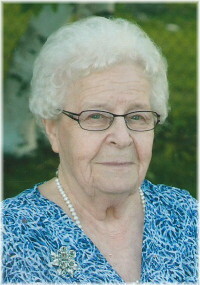 She will be lovingly remembered by her children, Eleanor Meisner, Dorothy Meyer (Larry), Henry, and Helena Unwin (Gordon); grandchildren, Heidi (Jason), Wendi (Glen), Andrew (Crystal), Krystle, and Brett (Argelia); great-grandchildren, Caleb, Eli, Aiden, Mason, Livie and Wyatt; her four sisters, Evelyn Zimmerman, Linda Herzog, Gladys Verch (Reinhold) and Marjorie Harwart; sister-in-law Irene Drewlo; as well as numerous nieces, nephews, relatives and friends. Violet was predeceased by her husband Arnold; son-in-law Wayne Meisner; her parents, Gustav and Emma Harwart; sisters and brothers-in-law, Edna Yaeger (Albert) and Clara Cesmystruk (Peter); brothers-in-law Edward Zimmerman and Ed Herzog; sisters-in-law and brothers-in-law, Lena (Herman), Art (Delila), Margaret(Ted), Emil (Almida), Linda (Bill), and Albert; and nephew Walter Roucek. Violet was born on February 20, 1925 in Winnipeg, MB. She grew up on a farm in Bayton School District. She married Arnold Drewlo on June 23, 1950 and they farmed in the Moosehorn area until moving to Ladywood in 1964, where they continued to farm until they retired and moved to Beausejour in 1992. One of Mom and Dad’s greatest pastimes was taking long Sunday drives with their friends. Mom was a long-time member of Grace Lutheran Church where she sang in the choir. She had unwavering faith in God throughout her entire life. She had many interests and hobbies, which included cake decorating, gardening, knitting, crocheting, casino trips, bingo, puzzling, and word search. Mom was happiest in the company of family and friends. After Dad passed away in 2003, Mom remained fiercely independent. She moved to South Haven and then to Stony Plains where she made many friends. Mom resided at East Gate Lodge for the past 11 months. Mom loved her family greatly and made sure to tell us that all the time. She was extremely proud of her grandchildren and absolutely adored her great-grandchildren and loved when they came to visit. Her youngest great-grandchild, Wyatt was born in November 2018 and although she didn’t meet him personally due to the distance, she got to know and love him through pictures and videos. Violet’s funeral service will be held on Saturday, April 13 at 2:00 p.m. at Sobering Funeral Chapel, 1035 Park Avenue E. Beausejour, MB with Pastor Ward Yunker officiating. Viewing will be held one hour prior to the service. Interment will follow in the Beausejour Cemetery. Pallbearers are Larry Meyer, Gordon Unwin, Andrew Meisner, Brett Meyer, Jason Barley and Glen Gosling. Our family would like to thank Dr. Van Rensburg and the amazing staff at East Gate Lodge, Shamrock Unit for the care, support and compassion they showed our Mother. Thank you to Pastor Ward, and Mom’s dear friends Anne and Val for all your visits that Mom enjoyed so much. A special thank you to Aunt Marj for always being there for Mom and us. Donations in Violet’s memory may be made to Grace Lutheran Church, Box 538, Beausejour, MB R0E 0C0 or East Gate Lodge (Recreation Department), Box 1690, Beausejour, MB R0E 0C0. Our deepest condolences to the family. Our thoughts & prayers with you all at this time. Thank you Wally and Marlene. To all Violets family . Alvin and I met her in Ladywood for the first time at my parents.. OUR SINCERE SYMPATHY to all the family. We used to visit when we sang at STONY PLAINS. GOD BLESS. Thank you Alvin and Alice. Helena, I am so sorry for the loss of your mother, hold your memories close. My deepest condolences to you and your family. Our sympathies to Helena & Gordon, & Henry. Your mom was such a kind, smart, & lovely lady. She was the most helpful to my mom, Mary, when my mom moved into South Haven. She took mom under her wing & showed mom the ways of living in town. She always told stories of farm life/being a farm wife, which always made me smile. She often told me that farm wives were still the same, just that some things were more modern now, but we still did alot of the same work. She made me feel part of a group larger than me. She was a lovely lady! I saw her at East Gate Lodge about a month ago. We were all attending a Church service, she was so happy to be singing. She was singing loud & proud just behind mom & me. Such a strong lady!! May she rest in peace, now her work here is done. May she fly with the angles. Thank you for sharing your memories of our Mom. Violet was such a lovely lady. She and Arnold were the perfect pair. Rest in peace, dear lady. We send our sincere condolences to the family. Thank you Jerry and Joan. My deepest sympathy to the whole Drewlo family. Your mother was such a warm and wonderful person whose faith shone through her words and actions. She and my Mom were great friends for over 50 years. What a wonderful legacy she has left for you all. May you feel God’s comfort and strength carrying you. Thank you Darlene. Our Mom cherished her friendship with your Mom. Helena, we are so sorry to hear of the passing of your mother. Moms stay in a very special part of our hearts even after they pass. Our thoughts and prayers are with you and your family. Thank you Rena and Chris. There are places in your hearts that will forever treasure your Mother’s love. There are places in your memory that will forever remember her stories, traditions, her humor and generosity. Our deepest sympathy to Violets family. She was a wonderful lady. Warm and kind. I have fond memories of singing with her in the church choir. I will miss her hugs and warm smile. I will not be able to attend the funeral but my prayers will be with you all. Dear Helena. Thinking of you during this sad time. My deepest sympathies to you and your family. Out condolences to the drewlo family. I had done Violet’s hair for many years. We had a lot of laughs and long discussions about many things. Very caring lady and always smiling. Thank you Connie and Paul.